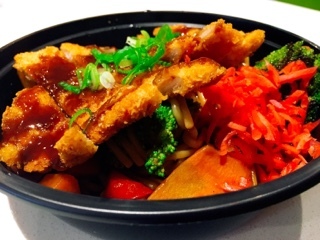 Started in 2015, Maki My Way currently operates two locations in downtown Toronto in the Theatre and Financial districts. Amongst the busy theatre row restaurants, this establishment is definitely more low-key and their quick-service concept is ideal for those who want a fast affordable meal. 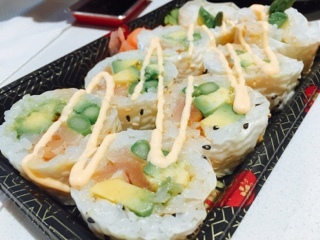 If you couldn’t tell by their name, Maki My Way creates customizable rolls where customers choose not only the ingredients inside the maki but also the sauces, garnishes, and wrapper as well. Starting at $8.50 for a set number of choices (one protein, two vegetables, two garnishes, and two sauces), additional items above the standard are about $0.50 apiece. We created a light summer roll made with Cajun albacore tuna (additional $1.50), asparagus, avocado, tempura bits, and masago all wrapped in a soya sheet that’s a lighter alternative to seaweed. Rob, founder of Maki My Way, finds the soya wrapper also absorbs the other ingredient’s flavours more. The crunch of the asparagus was essential against the otherwise softer ingredients and I was pleased with our creation, the highlight of the meal. 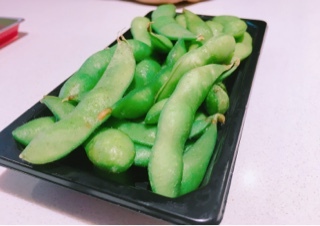 Despite not waiting long, the kitchen brought over an order of edamame ($2.50) to tide us over. They were nice and hot covered in enough salt for flavour, without leaving me thirsty. Personally, I found these were a better way to start than the chicken karage ($5.50); if white meat is used, it needs to be marinated as the chicken was a little tough and dry. Luckily, there was a liberal dousing of mayonnaise based sauce on top that helped rehydrate the appetizer. 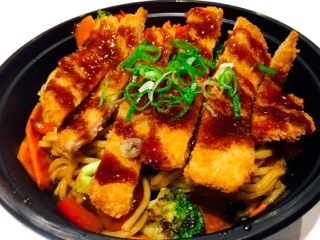 For $9.50 there was a hefty portion of springy yakisoba noodles tossed in a sweet teriyaki glaze and an equally sizeable pork katsu on top. 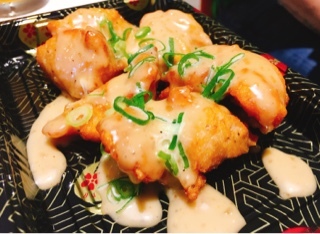 Although well flavoured, similar to the karage, the katsu was overdone so the pork bordering dry and chewy. Personally, I think the noodles would have been better with slivers of meat instead, since the stir fried noodles itself were very good with all the vegetables (asparagus, broccoli, red peppers, and carrots). The environmentalist side of me was a little disappointed to see disposable containers being used even for dine-in customers. Understandably, it helps simplify operations but with the amount of people visiting even during our lunch meal, the throw-away containers do a great disservice to Earth. Cutting down on waste is key, as this fall, Maki My Way may be expanding after Rob visits Dragon’s Den to pitch a franchise deal. He noted he’s taking the next step as customers who visit their King locations often ask when they can order customized maki closer to home. For picky eaters or those with food aversions, being able to choose what to add to a roll is a great idea. Good luck facing the dragons in the den.